Anyone visiting Champagne Jacquart’s elegant HQ in Reims, the Hôtel du Brimont, could not fail to be impressed. The meticulously and beautifully restored Art Nouveau château sits shoulder to shoulder with Krug and Roederer, an important architecural building that exudes quiet luxury and confidence. It might be surprising therefore, to learn that Jaquart is not owned by an ancient and noble Champagne family, but that it is a brand belonging to one of Champagne’s biggest cooperative cellars. Alliance Champagne is today an enormous concern, owning 7% of all Champagne’s vineyards, or around 2,500 hectares. But from the beginning the Jacquart brand was marketed separately and indeed structured so that it’s growers each became shareholders, allowing Jacquart to be classed as a Négociant-Manipulant (NM) on labels. In the latest edition of his World Encyclopaedia of Champagne and Sparkling Wine Tom Stevenson says Jacquart’s “trend is upward,” and that their bedrock Brut Mosaïque is “extremely underrated.” That progression in quality can only be enhanced by the appointment in 2010 of the determined and experienced young winemaker, Florian Esznak (below), enticed to join from Veuve Clicquot in 2010. Florian seems like a breath of fresh air in this confident and youthful company. A wise head on relatively young shoulders, the finished wines I sampled were impressive, suggesting that with a clear vision and the extensive resources behind Jacquart, it is indeed a brand to watch. 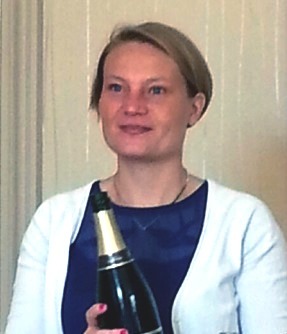 Our tasting commenced with Florian guiding us through the vins clair, the young wines of 2013 that had completed their first fermentation, and which she would soon blend before bottling to begin the second fermentation in bottle on their way to becoming Champagne. I can supply my tasting notes to any Champagne-obsessive readers interested, however this was very much an academic exercise – utterly fascinating with Florian at the helm – but of limited interest to most as these are raw fragments which, along with reserve wines from previous vintages, she will blend to construct the next Mosaïque and other cuvées. But the exercise was hugely interesting, showing marked differences between different vineyard sites where the same varieties had been grown. With the Pinot Noir samples for example, the Cru Neuville from the Cote des Bar was soft and gentle, with apple fruit and a cool, salt-licked acidity. The Pinot Noir from Mailly however had a much more tart, vegetal and green apple character, though good structure, whilst the Verzeney Pinot Noir had again a real running stream clarity, though Florian thought it was a touch dilute for her taste. We also tasted some of the older reserve wines including a 2012 Chardonnay from Le Mesnil that was wonderfully fragrant, a little almond and blossom nose, with a hint of smokiness and creamy apple. The 2009 Chardonnay from Chouillywas smoky, flinty, with such a suggestion of rich orange character, and lots of lemony acid bite. 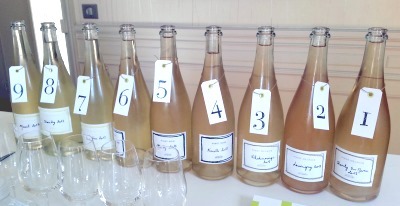 A sample of Chardonnay Oger and Le Mesnil from 2008 had a gorgeous floral lift with hints of pineapple and nectarine. This is a finished but as yet unreleased wine, based on the 2013 vintage. Pear and citrus in equal measure, with a nice hint of spice and elegant acidity. Very dry, pithy acids, and has some good structure. More than 100 wines in the blend form 60 Crus, the blend is 40% Chardonnay, 32% Pinot Meunier and 28% Pinot Noir, with 35% reserve wines from 2009 and 2010. 89-90/100. The current release of this wine. Based on 2009 vintage, disgorged six months ago, this has 9g/l dosage. Pale green gold. Lovely nose, green apples and a touch of brioche, a little suggestion of nettle, flint and caramel. Quite complex. Lovely cushioning mousse on the palate, with a suggestion of sweetness, but flows through very nicely with salt-licked acidity, and that nice sticky ripeness of the fruit giving it some earthy, toffee-edged character. Slightly sweet compared to the modish low and zero dosage wines of recent year, but very attractive. 30% reserve wines. 90-91/100. Yet to be released. Much earthier and flintier, with a touch of reduction, but nicely grippy, vivid and zesty with a lot of lemon peel and intense juiciness – “sticky” is how Florence describes it – nice extract and concentration. Avize for the saltiness and Chouilly are the major Crus in the blend, plus Oger and Cramant. Florian insisted on adding Cramant to the BdB blend since she has taken over – one of the many changes. 90-91/100. Gorgeous tiny bubbles, the third of a trilogy of excellent vintages. Lemony yellow, a touch of candied yellow fruits, a tiny floral expression, and some developed toast and brioche. Lovely palate, the raciness and juicy freshness of the acidity is delicious, flowing and fresh. 92/100. Made by ‘assemblage’, the 18% of Pinot Noir coming from 2008. Coppery pink. Delightful nose with lovely small red berry notes, lots of zingy fresh lemon and delightful freshness and expressive quality. Nice and savoury, plenty of freshness and clarity too , and some structure. 90/100. Very yeasty, lemony and fresh. Deliciously racy, hint of sweet ripeness on the mid palate, but such a lovely cleansing acidity. Bright and focused. Gorgeous race and length. 91/100. 50/50 Chardonnay and Pinot Noir, all from the Montagne de Reims. Lots of depth and richness here, plenty of yeast and autolysis, plenty of bruised pear and apple, and onto the palate there is terrific lemony crunch and crispness. The palate broadens a littlewith toast and a touch of butter, but the depth and finesse is delicious, still with a lovely apple cut. 92/100.See all stockists on wine-searcher.com.